Three beautifully appointed salons and the finest selection of couture gowns. Recently voted one of the Best 50 Bridal Salons, as well as one of the top, “most chic” bridal salons in the nation by Brides Magazine! All three Bridal Reflections salons have been recently expanded. Our salon on Fifth Avenue in New York City is the newest addition to the Bridal Reflections family of salons that began in Massapequa, Long Island in 1973 and quickly expanded into Carle Place/Westbury Long Island. Always family owned and operated, dedicated attention is paid to every detail. Bridal Reflections had garnered a reputation for the finest in customer service. With over 40 years of experience and family ownership, Bridal Reflections knows what goes into making every bride look and feel as special as the moment. Each of our three beautifully appointed wedding salons showcase a wide range of fashion from some of the world’s foremost designers in bridalwear. Our knowledgeable, friendly staff insists that every bride feels comfortable and unhurried when selecting that one special gown. It does not end there. Bridal Reflections will help bridesmaids and mothers of the bride and groom find a gown that perfectly complements the look and feel of the bride’s wedding day. We also carry a full range of veils, headpieces, jewelry, and all other bridal accessories to add that special touch. Call or email any of our three salons for an appointment or with any questions. One of our professional staff members will be happy to assist you. Also, please browse our website to learn more about us and our fantastic collections of designer gowns. 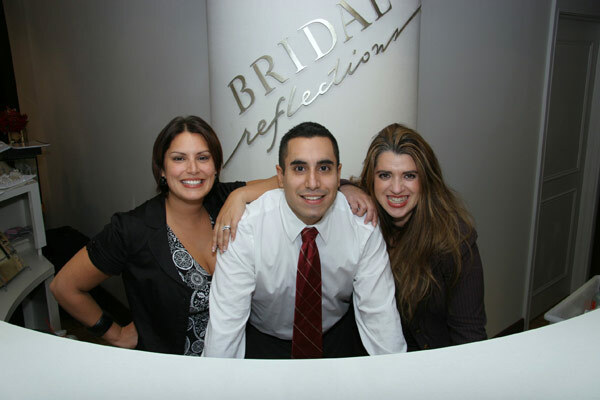 Meet the Bridal Reflections Staff Here!